The JDSU 10/100 BaseFX Ethernet LIM (J6831A) plugs into the Protocol Analysis Probe – DNA (J6801B), Protocol Analysis Probe – DNA MX (J6802B) and Protocol Analysis Probe – DNA PRO (J6803B) platforms. The 10/100 BaseTX Ethernet LIM (J6830A), 10/100 BaseFX Ethernet LIM (J6831A) and 1000 BaseX Ethernet LIM (J6832A) plug into the Protocol Analysis Probe – DNA (J6801B), Protocol Analysis Probe – DNA MX (J6802B) and Protocol Analysis Probe – DNA PRO (J6803B) platforms. The 10/100 BaseTX Ethernet LIM (J6830A) handles Ethernet and Fast Ethernet over unshielded twisted pair (UTP) cable. 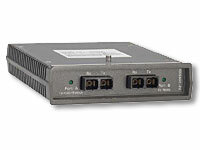 The 10/100 BaseFX Ethernet LIM (J6831A) handles Fast Ethernet over multi-mode optical cable. The 1000 BaseX Ethernet LIM (J6832A) accommodates a pair of GBIC interface adapters for handling Gigabit Ethernet over short reach (SX) or long reach (LX) optical fiber, or unshielded twisted pair (UTP), Category 5 cable, or any combination of these; a pair of SX GBICs (Short range Gigabit Interface Connectors) is included with this LIM. All three LIMs are capable of analysis and simulation.